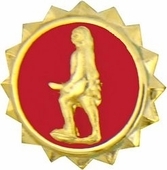 The U.S. Army Honorable Discharge Lapel Pin has a diameter of 5/8" and shows a gold minute man soldier in front of a red circle. The gold border on outer edge of the pin has 16 triangular points similar to a crown. (1) Soldiers transitioning with an honorable characterization of service (those being transferred to another component for completion of a military service obligation, and those receiving an Honorable Discharge Certificate). (3) Minimum 9 months continuous service—a break is 24 hours or more. (4) Active Federal service on or after April 1, 1984; or, service in a Ready Reserve unit organized to serve as a unit (National Guard unit or Army Reserve troop program unit) on or after July 1, 1986. (5) Retroactive issuance is not authorized. (6) No soldier separating from the Service is to be awarded more than one Army Lapel Button.